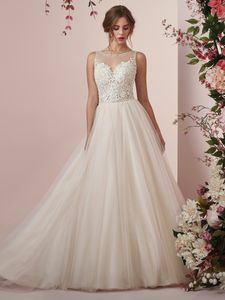 Description: Beaded lace motifs accent the sheer, sleeveless bodice of this romantic wedding dress, completing the illusion jewel over sweetheart neckline and illusion back. Attached beaded belt completes the ballgown skirt, comprised of tulle. Finished with covered buttons and zipper closure.